Rhea is clever, outgoing, and incredibly sweet. She learns quickly even if all her energy makes it hard for her to sit still through some of her obedience work. Her favorite game, apart from tag with her sisters, is hide and seek. She will always drop everything to go "Find Mom" or "Find Dad", no matter what else is going on. Her favorite way to interact is talking. When you ask her "what do you think", she vocalizes her thoughts as only a Tamaskan can. Rhea is a big fan of pulling our recumbent tricycles on her daily runs. 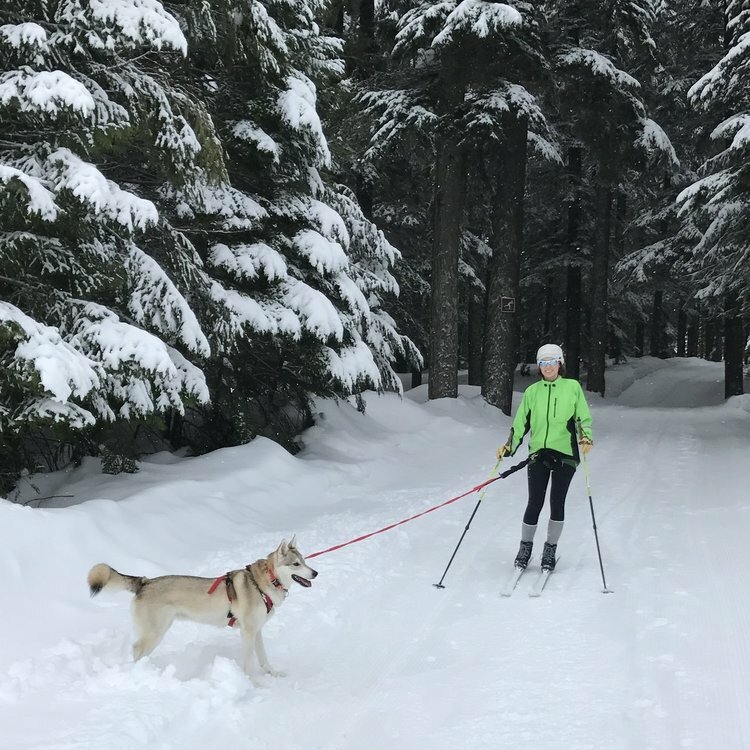 She certainly lives up to her sled dog heritage, and pulls the rig with remarkable strength. And if there happens to be a rabbit or squirrel ahead to tempt her, it is like having a rocket booster attached to the trike. Sophie is very loving. Her favorite place (when it's not too hot) is cuddling in someone's lap. She is excellent at adjusting her energy levels to suit the situation. Her "lazy athelete" ways make her a couch potato in the house, and a whirlwind of energy in the ring. When outside, she loves to run, jump on everything, and generally get her nose into whatever she can. As she has grown, Sophie has shown a great aptitude for climbing anything and everything. We recently started formal agility training with her, and it is like she was born for it. She has been wow-ing our trainer with how quickly she picks up the principles. The only thing that slows her down is when her humans mess up. In keeping with her laid-back personality, Sophie took to pulling our recumbent tricycles without batting an eyelash. It took a mere 10 minutes to get her accustomed to the pulling harness and rig before she was trotting alongside us as we pedaled, happy as can be. Sophie and Rhea are litter mates. Auri is energetic and cheerful. She is a never ending source of happy tail wagging, loving face-kisses, and motion. Her ever-vivacious personality endears her to all who meet her, and her capability for intense focus has made her a breeze to train. She excels in formal obedience work, and is one of the few Tamaskan we have met who enjoys playing fetch. Auri loves pulling us on our recumbent tricycle rig even more than her sisters do. While she was nervous about it at first, the ability to run at full speed while still being right next to us won her over. She most enjoys spending her downtime watching the shadows of birds and insects move across our patio, and teasing her packmates into a game of tag. These are the dogs which we have bred and have/will/may use them in our breeding program in the future. They live with guardian homes that provide them with a stable loving family environment, and come stay at White Elk while they are helping us maintain the breed's genetic diversity. Sitka is our pick of the Tuatha de Danan females. She lives with her guardian family in Vancouver, Canada, with Cypress (White Elk Xu Fu). 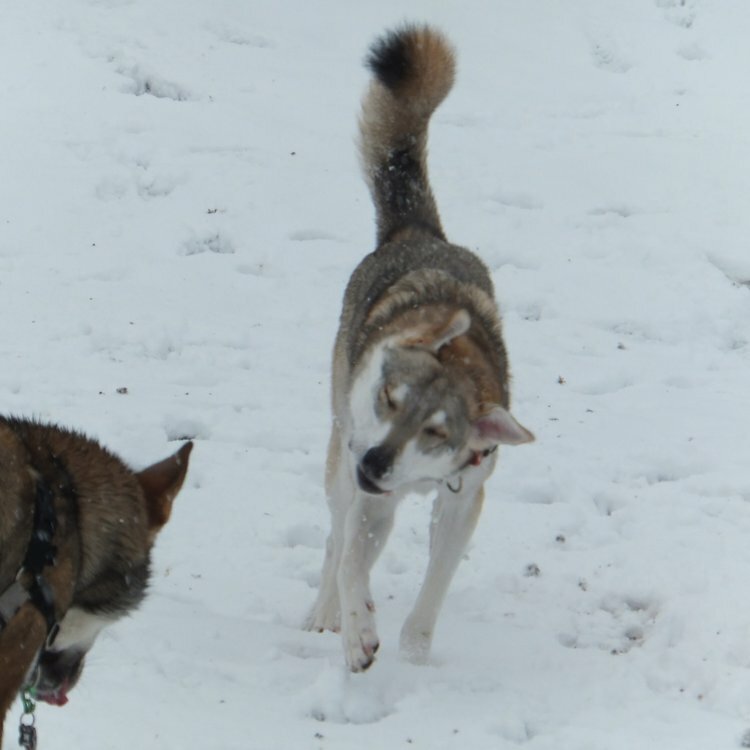 Sitka is highly attentive and very loving, she is particularly gentle and people oriented, even among Tamaskan. Cypress is our pick of the boys in the Explorer litter. He lives with his guardian family in Vancouver, Canada, with Sitka (White Elk Áine). Cypress is a gorgeous boy, almost a male version of his mother, Rhea (Saxon Aquila at White Elk). He is a very patient, disciplined boy. He is kind and gentle with his family's three young children and is an outstanding adventure companion. Cypress is energetic, intense, curious, confident and silly. Luchta is our pick of the boys in the Tuatha Dé Danann litter. He lives with his guardian family in Seattle, Washington, and is available as a stud. Luctha performed on Broadway in The Crucible which ran from March through July 2016. In his role, Luchta walked out on stage unaccompanied, stood in front of the audience for nearly a minute while sniffing the air and surveying the crown, and then ran off on cue. He trained for the role for a short 6 weeks and performed consistently to multiple packed houses for weeks on end during the run of the show.. His personality and the ease with which he took to the stage amazed Luchta's trainer. He was featured in a news broadcast for the production, NY Daily News Article: The "Wolf" in Broadway's 'Crucible' is Fetching Attention.